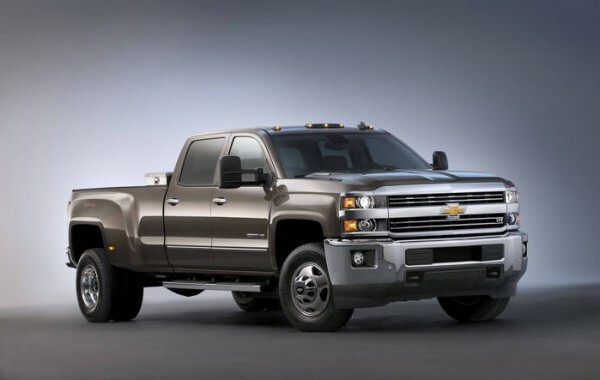 2014 Chevroelt Silverado and GMC Sierra HD Pickups Revealed – The Bunch Blog! General Motors has been in the process of renewing its entire full-size pickup and SUV lineup. One of the last pieces of the renewal is the 2015 heavy-duty trucks, which sport an all-new design inside and out, more capability and more refinement. It comes as no surprise to find that most of the changes on the new HD pickups mirror those found on the 2014 half ton pickups. Both Silverado and Sierra HD trucks feature beefed up versions of their half-ton counterparts exterior design, making them look brute and ready to work. On both pickups the front clip design has been enhanced with larger grille treatments, a taller hood and an integrated front bumper. The Silverado also has a significantly thicker crossbar across the front end, a notable design change from the current truck in relation to the Silverado half-ton. Also like the half-tons, the HD trucks feature all new sheet metal throughout the entire exterior with an overall more aggressive design treatment than the outgoing models. Sierra 3500 HD dually can also be had in Denali trim. The chromed-out luxury truck in dually form will look right home on a massive Texas ranch next to the wife’s Escalade. Of course, HD trucks are all about capability and GM has taken considerable effort to up the usability factor of the new HD’s, though technical changes are not as vast as those found on the 2014 half-tons. GM last revamped the HD trucks back in 2011; not that long ago. At that time they swapped the trucks to a new, stronger frame and made dramatic strides in capability. With that said, the 2015 models are more of an evolution of the existing trucks’ hardware with the same Vortec 6.0-liter gas V-8 and Duramax 6.6-liter diesel powering the brutes. According to GM they opted to continue offering the existing 6.0-liter V-8 as the base engine versus offering one of the half-tons new EcoTec3 V-8’s because of the 6.0-liter’s proven reliability. GM alleges that buyers of gas HD trucks are typically commercial customers that place a high value on reliability and low ownership costs, of which the 6.0-liter has. For 2015 the gas engine retains its power ratings at 360 horsepower (322 in 3500 models) and 380 foot-pounds of torque. In all applications the engine can run on regular gas or E85 fuel. New for 2015 is the availability of the 6.0-liter to run on compressed natural gas (CNG) in any cab configuration. GM is offering the engine with hardened valves and seats for CNG usage, which can be ordered from the factory (installed by a tier one supplier). This is the first time GM has offered CNG dual-fuel on all three cab configurations, including dually models as well. The HD’s Duramax diesel engine also remains unchanged with power ratings sustaining at a whopping 397 horsepower and 765 foot-pounds of torque. Both engines continue to be mated with six-speed automatic transmissions, including the Allison 1000 transmission for diesel models. Despite no significant changes to the drivetrains, the trucks are more capable for 2015. Maximum payload capacity has increased to 7,374 pounds, a number GM claims in the best in the industry. Conventional towing capacity has increased 1,600 pounds to 19,600, and fifth-wheel towing is up to 23,500 pounds from today’s 22,500 pounds. GM has accomplished the capability gains in part by enhancing the trucks’ fully boxed frame with increased strength. Engineers also put a stronger emphasis on the cooling system of the trucks to up reliability and capability. Along with the increased capability is a new focus on integrated controls with the HD trucks. For 2015, GM has integrated cruise control, Auto Grade Braking and Diesel Exhaust Brake for a holistic approach to trailering with the trucks. With the cruise control active, the trucks control systems will automatically utilize Auto Grade Braking and the Diesel Exhaust Brake to maintain a set speed. Each of these features interface with stability control and Trailer Sway Control (standard for 2015) to make trailering a less mentally demanding task. If the new half-tons trailering ability is any indication, these new HD’s should be fantastic at hassle-free towing. Inside the HDs is also a similar story to the half-ton trucks. Both Silverado and Sierra HD have the exact same interior as their half-ton counterparts. There are no significant differences in the interior from the half-ton; meaning there’s a ton of storage space and an overall more appealing interior package than the outgoing GMT-900 HD’s. Also like the half-tons, the 2015 HD’s are getting a ton of new features. Both 6.5-foot and eight-foot boxes come standard with GM’s CornerStep bumper and EZ Lift and Lower tailgate. A host of safety technology, such as lane departure warning, forward collision alert and GM’s Safety Alert Seat will be available on the HD’s as well. Sierra Denali HD also nets Denali-exclusive features, including a new eight-inch color reconfigurable gauge cluster. Overall the theme of the 2015 HD trucks is a lot like what we’ve seen from the half-tons and full-size SUVs. This is a very evolutionary update with a new look and incremental improvements in performance. There’s no question…the competition is already working on one-upping these trucks, but GM seems to have a slight edge thus far. The new HD trucks will arrive in showrooms in the first quarter of 2014.